Powerball winner Marie Holmes established a foundation named after herself to give back to the community. This year she gave almost 400 backpacks, 2 $500 checks, and a lot of gift cards for children to purchase clothing and shoes. 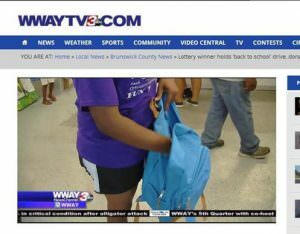 The event featured food, school supplies, fun and games for children. Even better news for the kids – Holmes says this is just the beginning and she plans to do this every August.